Systems installed on: Linux Mint 10, Mint 13 MATE, and Peppermint 3. Let me start this off saying that I'm not a Conky expert, nor can I provide a ton of help for anyone that runs into problems with this script. I also mention an error that I've getting at the end of the blog post, and would love to know how to get rid of it. What I was after was a clean and simple Time and Temp display for my Netbook that sits on a nightstand. It's really a glorified Clock radio. And the end results I got and wanted were something like this. 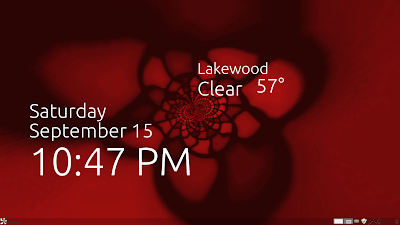 If haven't you already installed conky, and played around with it you will need to. For those that use the Ubuntu Repositories and PPA's this is how you do it. 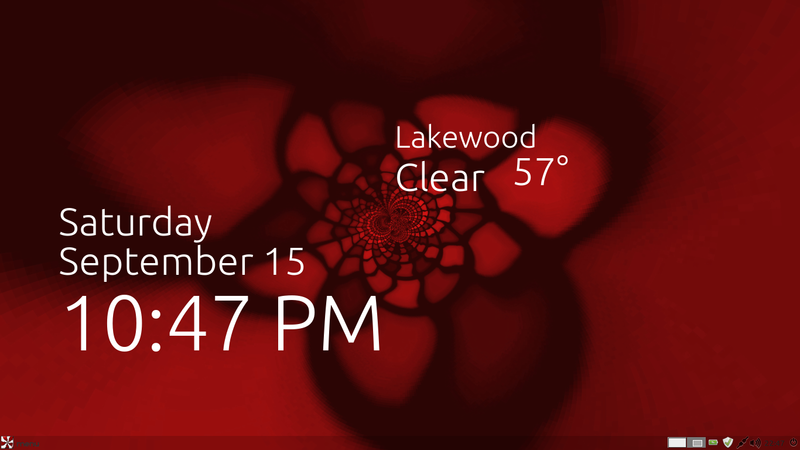 ConkyForecast and a few other conky tweaks are part of the "Conky Companions" PPA. Or Download ConkyForecast 2.24 for Linux from launchpad yourself. Once you have it installed that should be it for conkyForecast, but should you want to modify it, or need to modify it you can copy it to your home directory from within the terminal with this simple command, and then edit it with your text editor. I had to edit my .conkyForecast.config file, for fahrenheit instead of celcius temperatures, and I also removed a # mark on line 5 to make the .xml infor available to conkyForecast. Now that you've got conkyForecast on your system, next all your should have to do is to create or modify your .conkyrc text file. This can be the tricky part. Below is a copy of my .conkyrc file. OR you can download a copy of it from here. Be sure to save the text file as .conkyrc in your home dir. The location setting that I have is 44107, my US zip code. I am going to guess that any valid US zip code will work. If that doesn't work for you, try going to your city on weather.com and using the location code in the URL. OR try this posting to sort it out. Now you should be all set to run conky at the terminal and test it out, and/or add it to your start up applications.